This tribute can be made with or without the teddy. 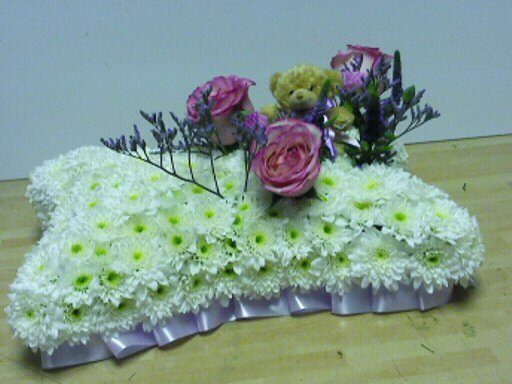 Tribute based in white flowers, but the placement can be changed to suit your own requirements. Includes a card with a hand written message for a more personal touch. This tribute is more suited to a younger person with the teddy in it. It can also be made without the teddy so as it would suit all ages. Based in white chrysants gives it a "fluffy" feeling. The edge of the ribbon can be changed to any colour you require.